This Villa, at NE Mallorca, is quite unique by its position. It is just on the water edge, at the Bay of Canyamel, with marvelous views on all the NE Coast of Mallorca. Nature there is absolutely well preserved; sea waters are crystal clear with turquoise and deep blue shades, beaches are sandy & safe, villages have character & history. The area is absolutely relaxing and enjoys, at the same time, of very charming and non expensive Restaurants & Caffes all around. At Cala Rajada, a nearby village, there is a lovely harbor and it is one of the most trendy towns of the island; fashion shops, Cafes , Bars, Night amusement etc. Sandy Beach is at walking distance from the Villa. Golf Field (18 holes) is just at 1 mile . You can practice all sorts of sports in the area : Swimming, Diving, Fishing, Tennis, Cycling, Horse Riding, Mountain walking etc. There are another 3 Golf Field in the area at a random between 5 & 8 Miles. A lovely one in the living area. Outside the house under some pine trees there is the private open-air parking of the house. It has freezer im the lower part. There is a Garden terrace with 2 sunbeds and one table and 6 chairs to eat outside overlooking the sea. Marvellous scenery . Long Balcony overlooking the beautiful bay of Canyamel. At 1 Km you will find Canyamel Golf. At at a range of 5 Km you will find another 3 Golf Fields. It is now the fifth time to come to this place with 4 friends which we call our "center of recreation and recharge". The house is most impressive because of the large window doors in the spacy lining room. The light is flooding the house. The view to the bay of Canyamel and the rocks on the left is unforgettable. The house provides quite practical furniture with couches to relax and spacy table for dining. WiFi is available and keeps you well connected to the world of either friends or business. What we really appreciated: as a house is equipped with a lot of techniques it might happen that maintenance might be needed. One call to a nice local guy: and any problem is being solved. What has become a good custom for all of us: going down to the beach not by car but walking along the cost line. It is worth to take this walk!!! We have done our booking for October 2016. I appreciate very much you enjoy your stays in our house on the border of the sea in the lovely bay of Canyamel.. I am very honored with your comments and how this place in Majorca has become so familiar and close to you. Thank you very much. Kindest Regards. We never slept so well and close by the sea. The early morning swims by the nearby creek are a landmark in our holidays. Restaurants around rank amongst the Island´s best! By all means we will check availability for next May. Thank you very much for your comments. I am very glad you appreciate the unique position of my house on the border of the sea, and you have such a nice feeling when being there. I will be very glad with your next visit in May. Best Wishes . We stayed in this house 10 days long. It is a house in a very nice area of Mallorca, not dirty or too much touristic. 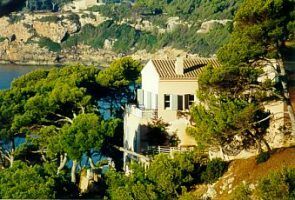 It has a wonderful view and evening sun, which is not common in Canyamel, only on the coves d'arthà. When sleeping, the see is beating against the cost, which we found very romantic and reassuring. A shock was, that it's not a villa, but this house is a part of a big building complex. The basin on the photo belong to all the parts and is the only one, so you are never alone there. Otherwise, there is not a real garden, only a very small stripe of grass on the very bottom of the house. The house is on three levels. There are only two real bedrooms (master rooms) in the house. The third bedroom (the photo is in reality shot in one of the master bedrooms) is a very very small room (double bed fits so in), which does not have any view and where the splash mechanism from the next door mini-bathroom is situated. What a real problem became, was canalization drainage stink. It started, first at nights, in one of master bathrooms. Soon, we could not brave the upper bathroom neither. The last two days we were all (6 people) in one master bathroom plus walking to the basement (chairs...chairs) for bowels. Otherwise, the house was OK. A bit dirty. Just do not go in, if you like details, nice remained and modern things, the highlight was Ikea..
You always need car to get to the beach with children. Forget the private beach - dirty, very small and private to other hundreds of people. We had nice moments in there. The nature a and the see views are unforgettable! The interior is okay, the master bedrooms quite nice and spacious, the one bathroom that does not have windows is a bit smelly. The bedroom upstairs is only suitable for two kids since it is very small and narrow. We did not use the bathroom upstairs since it was very small and smelly too. The set up was okay for us since we were two families with 3 kids - two of them sleeping in the small bedroom, our 2 year old in the baby bed in our master bedroom. My sister in law slept in the room downstairs and felt okay even though the door did not have a proper lock. The kitchen is well equipped, not the greatest quality but it will do for a vacation certainly. The balcony is a bit small but okay for an evening drink and when it gets hot during the day the garden is a nice escape from the heat. The stairs down to the garden could need a bit of fixing. All in all we very much enjoyed our vacation, the beach is one of the nicer ones in the area and there's other beaches there to explore (by car). Also, the area does not seem to be as touristic as others so we really did enjoy our stay. Pictures really don't do this villa justice. The house is set in an idyllic setting up above, but directly on the water and the balcony to this unit represents the extreme tip of housing for the north side of Canyamel. The views south to Canyamel are stunning and the location (access to beaches - Canyamel & private, Golf, Cala Ratjada, Tower, Capdepera, etc.) is great. The villa itself is modern and set up very well to handle up to four couples (we were 7 people). I would highly recommend this villa for anyone looking for a quiet retreat in Mallorca without reservation. We would love to come back. Even for the eight of us(family and friends) a lot of space for a comfortable stay.Beautiful sea-view from living room and three bedrooms.Lower garden terrace was perfect for the hot temperatures we had(30 to 35 degrees): shade from the trees and sea-view.Short distances to pool,small pebble beach or large sandy beach.Quiet location. Canyamel is a lovely seaside village on the NE Coast of Mallorca , at 1 hour drive from Palma de Mallorca. It has a lovely bay with a large Golden sandy beach , and it is so beautiful, that the legend says to be the place where Ulyses met the mermaid Nuredduna. The area has the highest standards of the island, and countryside is just marvellous. The following Bay is Costa de Los Pinos , and the Villa is looking towards the bay. Canyamel is a very well protected area, and villages around like Capdepera , Arta , & Son Servera with medieval castles and very mallorquin streets keep all the character of the history. Rental rates are per week in GB Pounds. Bookings go from Saturday (5pm) to Saturday (11am).